When the Amsterdam Centre for Architecture (ARCAM) asked fashion designer Mattijs van Bergen and landscape architect Anouk Vogel to collaborate on a crossover piece, the duo was immediately struck by the disparity of their respective fields. Van Bergen, for instance, was beholden to the tempo of the ever-shortening fashion cycle, while Vogel’s living designs flourished and evolved season after season. For ARCAM’S Fashion & Architecture exhibit, van Bergen and Vogel chose to design a dress that would be the antithesis of fast fashion—a living object that brought each season to life with changing floral arrangements. 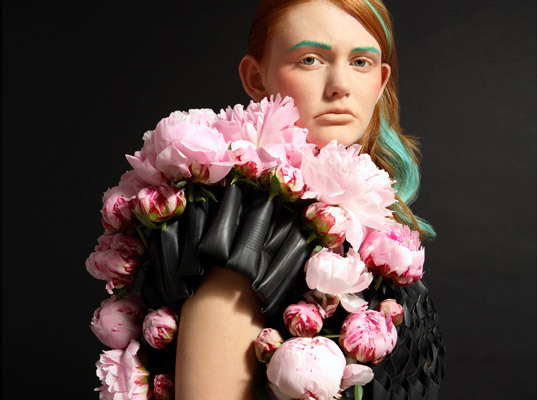 Cleverly devised from recycled bicycle inner tubes and wool, the dress’s smocking-like surface is the result of myriad individual “vases” that can be filled with water. Depending on the type of flowers used and how they’re positioned, the appearance of the dress changes completely. Even when it’s worn on its own, the frock possesses its own innate beauty, offering an empty canvas for a lifetime of shifting looks. The dress will be on display as part at ARCAM in Amsterdam through September 11, 2010. That's gorgeous! 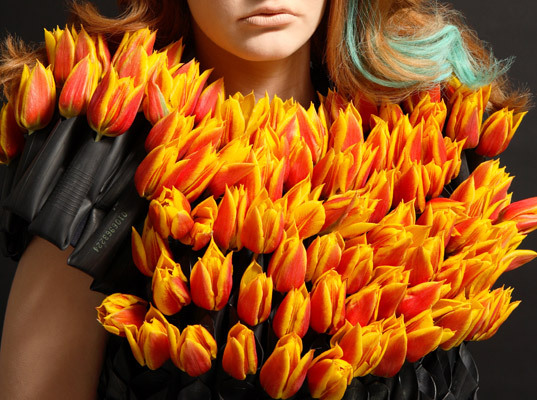 I'd love to see something that was actually growing with the seasons for a symbiotic fashion ecology statement.